Our previous blog post showed that over the last 10 years, the 91-93 point Margaux 2001 had appreciated in value more than the 100 point 2000. Now we consider if this is a more general insight into returns across the vintages. 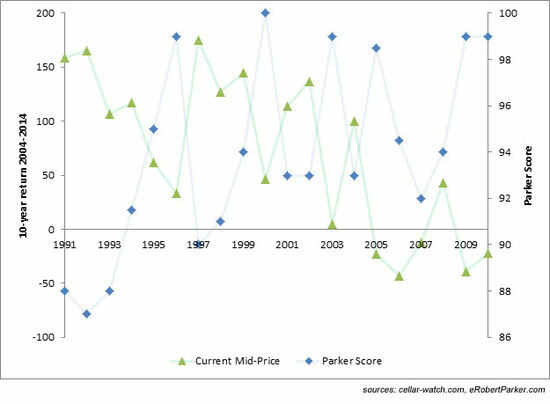 Across the last 20 vintages of Margaux (1991 – 2010) there is a negative correlation between the 10-year return as shown by Cellar Tracker and Parker’s score; that is to say that a high scoring wine will often have low returns and vice versa. For the first growths, this pattern is specific to Parker’s rating of the individual wine, rather than the vintage as a whole: 2003 appellation Margaux was not the best (88 on Parker’s vintage charts) but the Ch. Margaux 2003 scored 99 points and fits the trend with a correspondingly low return. A quick aside: Vintage 2006 stands out, not as an exceptional vintage, but for depreciation following its release. This was an unfortunate consequence of the good market performance in 2007 (the previous vintage of Margaux had appreciated 65% within the first year) and the en primeur campaign released the 2006 at three times the value of the 2004 and higher than the 99-point 2003. In defence of Ch. Margaux, the release price was also less than half of the trading price of 2005 at the time of release, but as the market subsequently fell the returns were not to be seen. First growth producers are very astute judges of the potential quality of their wine, and adjust prices accordingly. There is a greater premium placed upon the exceptional vintages in the marketplace, and so vintages with the potential to score extremely well are priced particularly highly in the en primeur sale, directly reducing returns. Lesser vintages often drink younger, which reduces the amount of these wines in the marketplace. The ever-increasing scarcity pushes up the price as there is greater competition for these wines that are ready for drinking. The end consumer may not be totally focused on the vintage, but also on the prestige of the chateau. Demand for Ch. Margaux is naturally higher than for a specific vintage of Ch. Margaux, (the latter being a subset of the former) and therefore demand can spill over from the sometimes unaffordable best vintages to the lesser vintages. Therefore the low market price of lesser vintages is an appealing alternative to the consumer and demand pull inflation ensues. As a wine investor, lesser vintages become all the more appealing with demonstrated returns and shorter holding times.